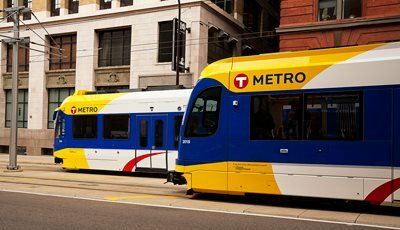 Free Metro Transit Passes Available for Download! FREE Metro Rides & Electric Shuttle! Thanks to Metro Transit, enjoy a free ride to and from The Energy Fair Saturday Sept 9 and Sunday Sept 10. We are excited to announce there will be an ALL ELECTRIC shuttle bus running from Union Depot to The Energy Fair Saturday Sept 9 and Sunday Sept 10 thanks to New Flyer. Saturday Sept 9: 8:30am leaving from Union Depot to 11:30pm leaving from Harriet Island Park. Sunday Sept 10: 8:30am leaving from Union Depot to 5:30pm leaving from Harriet Island Park. Pick-up and drop-off at Union Depot is located in front of the building on the eastbound side of Kellogg Blvd. The address is 240 E Kellogg Blvd and there will be a sign on the sidewalk marking the location. Have a look at other transportation options and area lodging here.